I’ve been accused of being twisted sometimes. It’s true. My twistedness reveals itself at surprising times. But I’m not writing to share about my twisted sense of humor. I’m writing about a towel. Some smart woman got tired of twisting her just-washed hair into a bath towel that may or may not stay piled and balanced on top of her head. Forget picking up after a toddler or leaning over to pick up anything without the bath towel flopping off her head. After one use, I was in love. My older daughter was, too. Two or three years later, the little elastic loop on my original Turbie Twist is stretched and elastic-less. Don’t care. One of these days, I’ll fix that, but it still works. My younger daughter has been asking for her own “hair towel” for months. The requests escalated after she used mine. My towel disappeared one day. I found it in the girls’ bathroom. Coincidence? I think not. A couple of weeks before Christmas, my mom-in-law asked me about little gifts she could get for the girls’ stockings, I told her about the Turbie Twist towels. I think she may have looked at me sideways, a little, like I was crazy, but she picked up enough for all four of her granddaughters. I have a new obsession! Yesterday after talking with you on the phone … There was a huge wall display of Turbie towels. I stared at them for a long while wondering what was the fascination with these little towels? I was looking for some new pillow cases, but walked out with a Turbie towel 2 pack :). I couldn’t resist after our conversation …. I used it this morning for the first time and I loved it! I have been using 2 towels forever. One for my hair and one for my body. I would twist the towel up on my head and walk around like that for awhile. This Turbie towel was so much lighter on my head. I fell in love with it! I can’t believe I had never heard of this wonderful invention. My head was so light and free this morning! I even looked at towels while I was there. That is one (of many) things I want for my new home. This time I will only have to buy 2 towels instead of 4 – what a savings of money and laundry time! Thank you so much for telling me about this wonderful product! Seriously, the BFF would make a great commercial. She ended by asking if there was a blog post in there somewhere. D’oh! Then this morning, she told me she didn’t have to take the towel off to put her turtleneck on. Try that with a bath towel piled on your head! This video shows how simple it is. The kiddo in the video is adorable, too. BTW–I have no connection to the company. I just love the product. I don’t know why I didn’t think to share this with everyone sooner! While I think about those really cute animal print ones that I saw at the store, I’d love to hear what’s going on in your head. Is there a product that you wish you’d invented or sold? 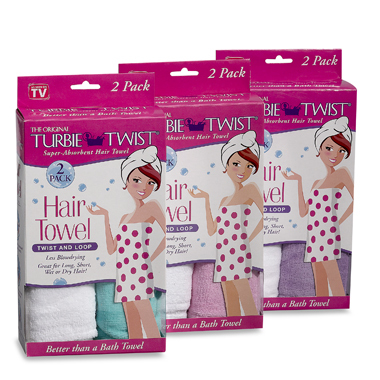 Have you tried a Turbie Twist towel?